CheckBox is one of the UserForm control. You can select and drag CheckBox on the UserForm. CheckBox Control is used to specify or indicate binary choice. That is either Turn on or off a value. When we use more checkboxs, you can select more than one CheckBox at a time on the UserForm. You can select multiple check boxes in a group box. Please find more details about CheckBox Control in the following chapter. Go To Insert Menu, Click UsereForm. Please find the screenshot for the same. Drag a check box on the Userform from the Toolbox. Please find the screenshot for the same. Now, you can see the following code. Note: In the above code ‘CheckBox1’ is the Check box name. Please add the following statements to the procedure. MsgBox "Checkbox has Checked", , "Checkbox"
MsgBox "Checkbox has UnChecked", , "Checkbox"
Run the above macro by pressing F5. Check and uncheck the check box twice to get the two different outputs. Please find the following steps and example code, it will show you how to add dynamic checkbox control on the userform. Call the below procedure named ‘Add_Dynamic_Checkbox’ and find the below procedure to run. Now, click F5 to run the macro, click ‘Create_Checkbox’ button to see the result. You can see the created dynamic check box in the following screen shot. Select or UnSelect a CheckBox using VBA? 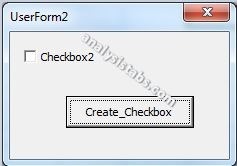 Please find the below code to know how to select or UnSelect a check box using VBA. In the below example we are using value property of the check box to select or UnSelect a check box. Please find the below code to know how to check if a check box is selected or not using VBA. In the below example we are using value property of the check box. Here is the link more about how to add check box control on the Worksheet or UserForm in Excel. Here is the one more link to more about how to add check box control on the Worksheet or UserForm using VBA in Excel. Here is the one more link to more about how to remove check box control on the Worksheet or UserForm in Excel.